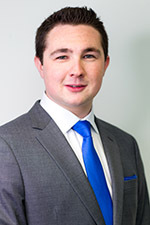 Gerard joined TWM in December 2018 as a graduate of the Masters in Real Estate from Dublin Institute of Technology. Before embarking on his masters Gerard worked with REA Cumisky with a focus on the North County Dublin residential and commercial property markets. Gerard also obtained a Business degree in 2016 from the National College of Ireland. Gerard works with the investment and agency team.